As you may have noticed, the Route 66 Chronicles posting this week was less than anemic and the weekly publication of your Route 66 stories did not take place. I have a litany of excuses but as you are aware, seldom do excuses constitute justification. A short summary of the week includes issues with Blogger itself (the page for the publishing of your stories has become a puzzling issue), development of promotion for Ramada Kingman, grand jury duty selection, a series of valiant efforts to install Windows 10 (seven before achieving success), an endeavor to create a podcast that somehow morphed into a radio program, accepting a position to the cities historic preservation committee, and the creation of a photo file for the new book. In my spare time, in a fit of temporary insanity, agreed to arrange the official dedication for the Running Hare, a sculpture created by Donald Gialanella. 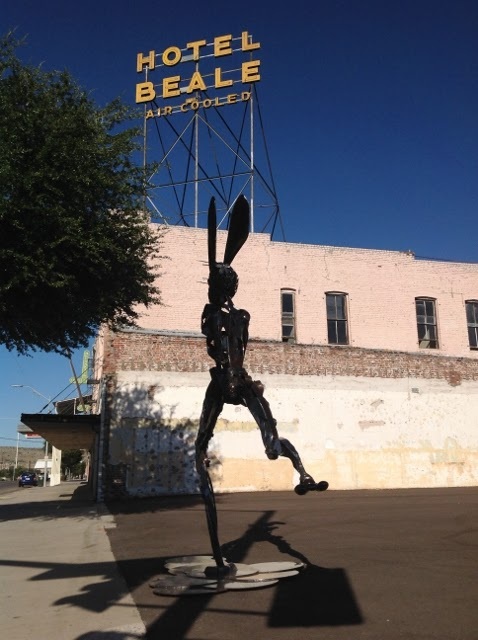 The Running Hare, sponsored in part by the Route 66 Association of Kingman, has become a rather unlikely attraction. With the planned addition of custom themed benches, some landscaping, and murals, the former eyesore at the corner of Fourth Street and Andy Devine Avenue might become Kingman’s answer to Standin’ on the Corner Park in Winslow. Next week, we will continue with the publication of Your Stories series. I do apologize for the delay. If you have a Route 66 story to share, send it in. Remember, a winner will be selected each month and the prize is a copy of Travel Route 66. The recent passing of Laurel Kane of Afton Station has reignited discussions about the future of Route 66 as the old guard passes. I also have concerns about what the future holds for the old road and its culture but we have to always temper those worries with a realization that Route 66 has always been in a state of evolution. Nothing has changed in the era of renaissance. To alleviate those concerns and to garner a glimpse of what Route 66 may look like in its centennial year, I suggest following the work of Rhys and Samantha Martin of Cloudless Lens Photography, and Chris and Katie Robleski of Fading Nostalgia. These passionate folks represent a new generation of two-lane highway enthusiasts, the first that do not have an association with Route 66 when it was still a certified U.S. highway. Most of the stories posted recently have focused on the roads past. I would also like to share stories from the modern era and the perspective of a new generation. I also would like to share stories from international enthusiasts. These perspectives are being woven into the current book project. As this endeavor developed it became increasingly obvious that there was a need to present Route 66 as it is, and as it will be rather than just as it was. With that said, I need to close this out for the day. Today’s schedule calls for work on the aforementioned book, scheduling an interview with News Channel 3 in Las Vegas, sending out invitations for this months Route 66 Association of Kingman’s monthly meet and greet, creating a contact list for the submission of press releases to promote projects at the Ramada Kingman, and the ongoing quest for sponsors as I kick off the 90th anniversary Armchair Tour of Route 66 series of presentations.